Air Tractor - AT 802, Red Lake, Ontario. A break in the weather today meant we were able to head out to the Red Lake Airport to take a look at Guy's reason for being stationed here at Red Lake. Guy has been flying a bulk fuel hauling aircraft called an Air Tractor. Although the Air Tractor has been used for many years around the globe, this particular model is the first of it's kind in the world and it was modified here in Canada!! The plane has it's own spot out at the airport - tucked well away from the rest of the aircrafts. As we rounded the corner - there it was in all it's yellow splendour a unique and almost mean looking plane. Guy opened up the cockpit and gave us a tour of the controls before offering me a chance to sit in the pilots seat. After posing for a few pics complete with the special helmet and gloves - the rain came! Actually the rain really came so we rushed to close up the Air Tractor then ducked for cover from the contents of a few very dark clouds above. Before heading back into Red Lake we stopped off briefly in Balmertown for a few supplies. 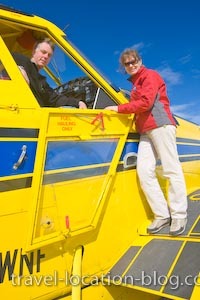 Check out our story Taking to the skies with Canadian Bush Plane Pilot Guy Cannon which we wrote for the HickerPhoto.com Travel Channel.